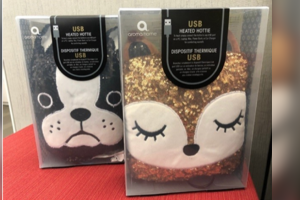 Aroma Home USB Heated Hottie heating pads sold at T.J. Maxx and Marshalls stores are being recalled due to fire and burn hazards, according to the U.S. Consumer Product Safety Commission. The animal-themed sequined heating pads were sold nationwide from November 2018 through January 2019. The recall says the heating pads can overheat while being used, which poses fire and burn hazards. Consumers who bought the product can contact T.J. Maxx or Marshalls for a full refund. You can call T.J. Maxx at 800-926-6299 and Marshalls at 888-627-7425 from 9 a.m. to 6 p.m. Monday through Friday.